Violet Poe Projects is an independent artist-project space that Kendra Paitz founded in her home in Bloomington, Illinois, in 2010. Artists are invited to realize one-night, site-responsive projects in various areas of the domestic architecture and surrounding landscape. Artists may choose to alter any area(s) of the house or yard as long as they do not permanently change or damage any structures. In keeping with its commitment to supporting artists' visions, Violet Poe Projects does not accept commission fees if an artist sells a work. 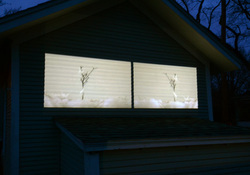 Image: Dawn Roe, I-55 Back/Forth (After Michael Snow), 2-channel video installation. Installation view at Violet Poe Projects, March 2011.